This simple but lovely rose and daisy bouquet is a gift within a gift. 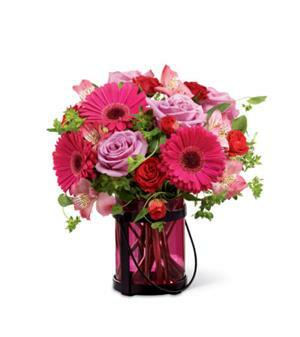 A lovely pink and purple flower bouquet is created in a cute vase. This simiple but lovely arrangement is a gift within a gift. A lovely pink and purple flower bouquet in a cute vase. The flowers are a combination of gerbera daisies, alstromeria, spray roses and large roses.